For my birthday a new friend and kindred spirit gave me a copy of Anne Morrow Lindbergh’s book Gift from the Sea. Though written fifty years ago I’d never heard of it before. The book is the result of the author’s experience while spending a month alone in a cottage on the beach in Captiva Island, FL. I happen to love the beach and the water and I’m fond of Captiva Island so the idea of spending a month there in an old beach cottage by myself with nothing to do but read, write and sit and listen to the waves sounds wonderful to me. Of course it also sounds like a distant dream which is why the origin of this book intrigued me. I mean if I can’t do it, I might as well glean something from the heart of one who has. I sat down to read this book, not surprisingly, after I’d spent the day at the beach last Sunday. I was hooked after reading the opening paragraph. The beach is not the place to work; to read, write or think. I should have remembered that from other years. Too warm, too damp, too soft for any real mental discipline or sharp flights of spirit. One never learns. Hopefully, one carries down the faded straw bag, lumpy with books, clean paper, long overdue unanswered letters, freshly sharpened pencils, lists of good intentions. The books remain unread, the pencils break their points and the pads rest smooth and unblemished as the cloudless sky. No reading, no writing, no thoughts even–at least, not at first. At first, the tired body takes over completely…Rollers on the beach, wind on the pines, the slow flapping herons across and dunes, drown out the hectic rhythms of city and suburb, time tables and schedules. One falls under their spell, relaxes, stretches out prone. One becomes, in fact, like the element on which one lies, flattened by the sea; bare, open, empty as the beach, erased by today’s tides of all yesterday’s scribblings. Treasure. That’s what I’m expecting to find as I carry my bag down to the beach. I’m looking for those treaures you find once the tide has come in and then gone out. I suppose my problem is I’m looking for them too soon. I’m looking for them while the tide is still high. I need time for the water to recede, for the beach to be laid bare with all it’s treasures to behold. O what I could do with a whole month alone at the beach–a month to sit with my toes in the sand, to not read but then read, to stop thinking so that I could think clearly. My practical and realistic brain says dream on…. My contemplative heart does just that. I’m happy (and surprised) to report that no one covered their ears or walked out. Aside from that I can’t say much more about my guitar playing; only that despite the occasional missed chord and somewhat awkward strumming patterns we actually worshiped Jesus and in the end that’s all that matters. Learning to play the guitar has been a good experience. Along with giving me greater empathy for Claire whenever she struggles to learn a new skill in her schoolwork it has done something for my spirit. I couldn’t exactly put my finger on it until last night. Our parish mission is going on this week. Father Malley is teaching a series on the Theology of Beauty and focusing on the mystics. Toward the end of last night’s session he referenced a book on contemplative prayer that talked about practical ways to develop contemplative prayer habits and to experience the beauty of God. Interestingly, one way he discussed was learning to play an instrument and surrounding ourselves with the beauty of music. That’s when I had one of those light bulb moments. The last couple of months have been challenging for me. Actually the last year has been somewhat emotionally exhausting. Just to clarify, I’m not in “dire” circumstances of any kind. I have much for which to be grateful; I am fortunate in that my children are healthy, my marriage is securely intact and all of our physical needs are more than taken care of. But even still, there have been enough waves in our life lately that it seems like just when I get my head above water another wave engulfs me. In the midst of all this “stuff” my friend Tina challenged me to learn to play the guitar so that I could lead music for some meetings and a women’s retreat this spring. I’m a deadline driven person (a euphemism for “procrastinator”) and this was just the thing I needed to force me to finally learn how to play; I’ve been picking up the guitar off and on for about 6 years now without much progress. Learning to play the guitar has been a welcomed distraction from some of the harder things going on in my life. 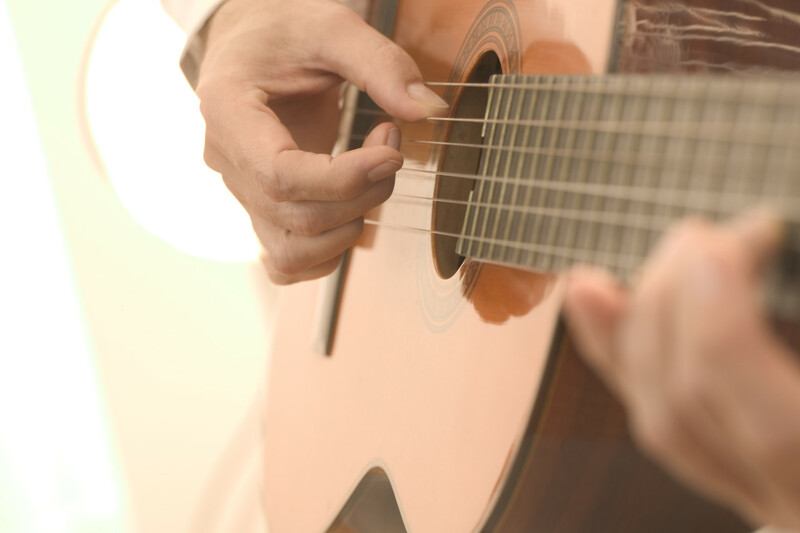 But more than that, practicing the guitar and playing worship music forces me to contemplate Him more. It requires that I spend more time praising Him with my heart and less time trying to figure things out with my head. Sometimes I can get so stuck in my head analyzing things. For me this is not a good thing. On the days when I’ve been “stuck” and felt like doing nothing I’ve forced myself to pick up the guitar and sing and cry out to Him. This gift of music has been healing for my soul. In what ways can you slow down today and spend more time contemplating Him with your heart? You are currently browsing the archives for the Contemplating Life category.